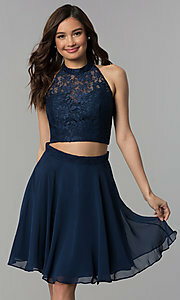 Bring on the party in this two-piece short homecoming dress that is on-point for hoco 2019, a wedding reception, or other semi-formal event. 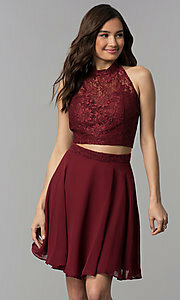 The two-piece party dress features a trendy high-neck crop top with sheer floral lace over a sweetheart lining. 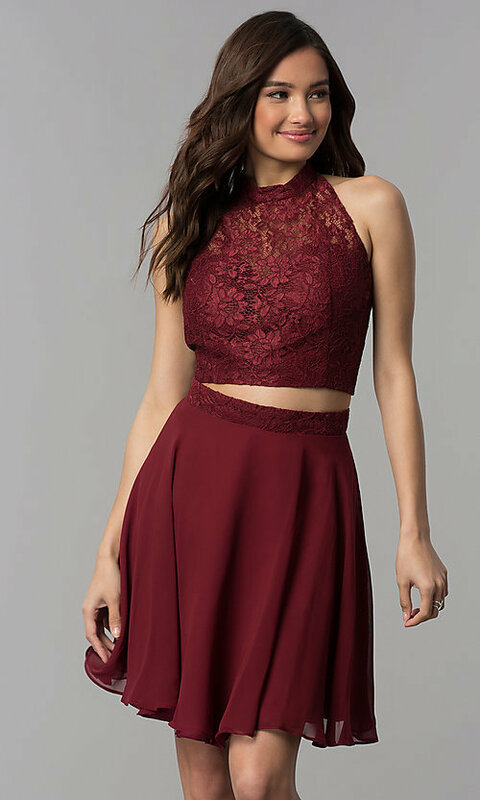 The lace top includes cut-in sleeves and a collar that attaches to the racerback. Bold bands in sheer lace beautifully frame the stylish back cut-out detail. Matching lace defines the natural waistline that tops the layered short chiffon a-line skirt on the fabulous short dress. Balancing up-to-the-minute trends and feminine style, this two-piece short homecoming dress is an elegant choice for a variety of special-occasion celebrations. Top 15" Bottom 21" Hollow to Hem 31"